Recorder of Deeds Karen Yarbrough is officially asking a company operating under the name “Home Title Lock” to cease and desist from using the name of the Office of the Cook County Recorder of Deeds to sell a fraud monitoring service that Cook County Recorder of Deeds offers for free. Click here to see the full Press Release from the Recorder’s office. Newly-elected Cook County Assessor, Kritz Kaegi, would like to share his reform plan and answer any questions you may have regarding your property assessment and taxes. Please click here to see a list of the locations and dates where you could join him. 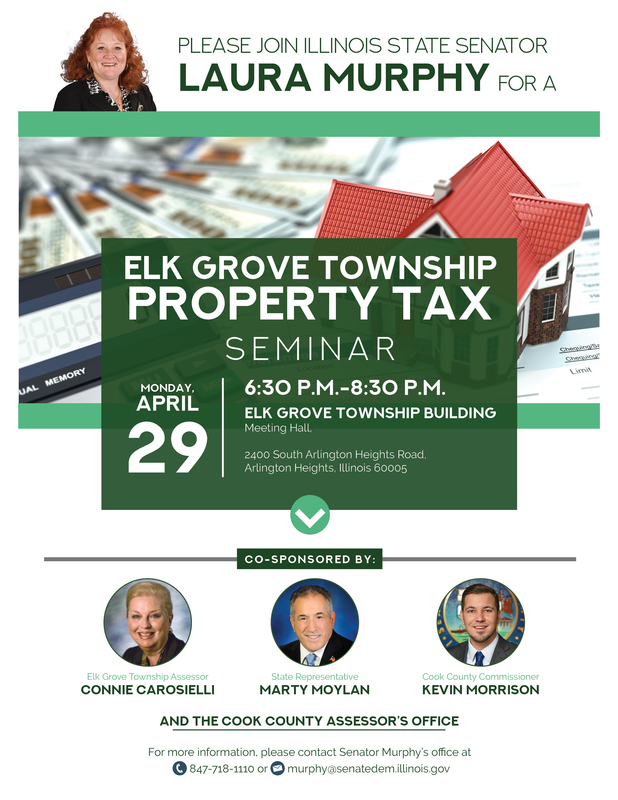 During the upcoming reassessment period the Township Assessor’s office will be hosting a seminar sponsored by State Senator Laura Murphy in conjunction with Cook County Assessor Kritz Kaegi. Click here to see a flyer with additional details about the event. Click here for information on how to reserve your seat at the upcoming annual “Property After Death” forum that will be presented by Edward M. Moody, Cook County Recorder of Deeds. Active Duty Military Personnel and Veterans are eligible for a Cook County Military and Veterans Discount Card. Click here to view programs’ information. Click here to read the Assessor’s January 2019 edition of “Assessing the Situation”. Recently signed legislation has finally brought property tax relief to our residents. Click here for additional information that might affect your second installment property tax due and payable in 2018. 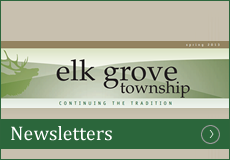 Connie Carosielli – First elected in 1989, Connie takes pride in the increased levels of service to the Elk Grove Township residential taxpayers that have occurred during her tenure. Functioning as “taxpayer advocates”, her staff has saved taxpayers millions of dollars in their effort to establish accuracy and fairness in the Cook County property tax system. A graduate of University of Holy Names College in California with post graduate work, Connie has lived in Mt. Prospect for over 40 years, and is committed to serving the community. 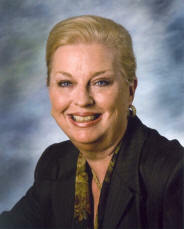 Laurie Wagner – Laurie Wagner has been with the Assessor’s Office since 2002. She received her Certified Illinois Assessment Officer (C.I.A.O.) designation in 2004. Mrs. Wagner came to the Assessor’s Office from the recruiting and employment field. Laurie has been a resident in Mount Prospect for over 35 years and has one daughter, Carri. Role of the County Assessor – The Cook County Assessor is required by law to identify and assign fair market values to all properties in Cook County. The Cook County Assessor does not set taxes, mail bills or collect taxes. The Assessor is responsible only for your assessed valuation. 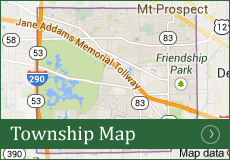 Role of the Township Assessor – By statute the township Assessor is the Deputy to the Cook County Assessor and is under direction from that office. 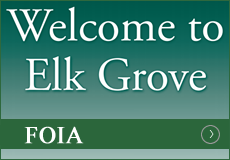 However, since the Township Assessor does not assess, this office is in the unique position to assist Taxpayers with assessed value complaints, along with other services such as filing exemptions. It is important that you know that any question that you might have in regard to property tax can be directed to our office. We will be happy to give you all the information at our disposal. If we do not have the answer to your questions, it will become a priority to get the information for you. 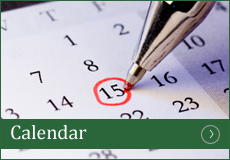 Our office hours are Monday through Friday 9 A.M. to 4 P.M. or call us at 847-437-0300. Why Property Taxes Go Up When Value of Home Goes Down? www.cookcountytreasurer.com The Treasurer’s web site allows you to check the status of your property tax bill payments as well as directing you where and how to pay your tax bill. Information is available on refunds, services for senior exemptions and tax dates. www.ccrd.info The Cook County Recorder of Deeds website can be used to look up information about property transaction, deeds and mortgages. www.state.il.us/agency/ptab The state of Illinois Property Tax Appeal Board (PTAB) website will provide information on how to file an assessment appeal at PTAB. **ALERT***Be advised that you may only file an appeal at PTAB if you have previously filed an appeal at the Cook County Board of Review for the tax year in question.